7pm: Datuk Seri Dr Chua Soi Lek is the new MCA president. The former MCA deputy president polled 901 votes. 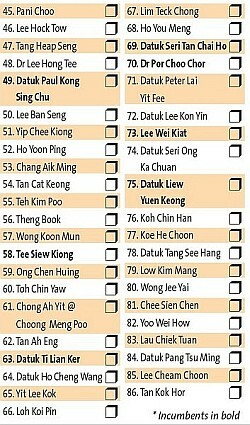 His nearest challenger was Tan Sri Ong Ka Ting, who received 833 votes while incumbent party president Datuk Seri Ong Tee Keat garnered 578 votes. 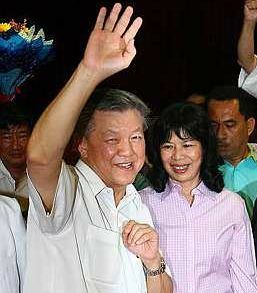 Datuk Seri Dr Chua Soi Lek celebrates with his wife Datin Seri Wong Sek Hin after winning the MCA presidency. Dr Chua says he would be “inclusive” and practise collective leadership as the new party president. Deputy: In the straight fight for the deputy presidency, Datuk Seri Liow Tiong Lai won over Datuk Seri Kong Cho Ha. 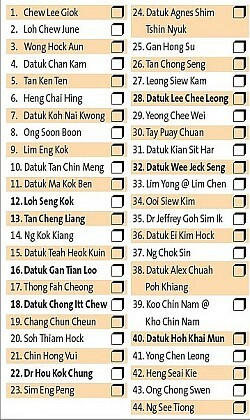 Liow received 1,171 votes to Kong’s 1,106 votes. 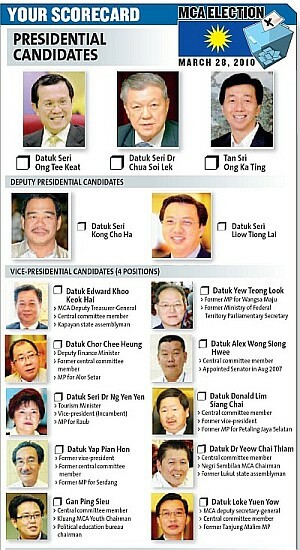 Vice-presidents: Datuk Seri Dr Ng Yen Yen (1528 votes), Datuk Donald Lim Siang Chai (1469), Datuk Chor Chee Heung (1202) and Gan Ping Sieu (1202). 6.30pm: Incumbent MCA president Datuk Seri Ong Tee Keat arrives at Wisma MCA to await the election results. 6pm: Candidates start arriving at Wisma MCA. Presidential candidate Tan Sri Ong Ka Ting arrives with deputy president hopeful Datuk Seri Liow Tiong Lai arrive at about 6.10pm. 5.45pm: There is a tie for the 25th Central Committee post (only 25 seats are available). Gan Hong Su and Datuk Alex Chuah Poh Khiang are called to the stage. They ask for a recount. 5.15pm: MCA delegates file back into Wisma MCA to await election results. Datuk Seri Dr Ng Yen Yen arrives at the party Hq to say thanks to her supporters, an indication that she may have won her bid for a vice-president’s post. 5.10pm: Vote-counting for vice-president posts ends, counting for the deputy president post begins. Some scrutineers also start counting votes for the keenly contested three-way fight for the president’s post. Some candidates for the 25 Central Committee posts are seen shaking hands with their supporters, who applaud, shortly after CC vote-count completed. There were 86 candidates who contested for the posts. 4.30pm: Vote-counting for Central Committee members end. Tallying for the four vice-presidential posts begins. 3.40pm: Scores of supporters are at the second and third floors of Wisma MCA witnessing the counting inside Dewan San Choon via live telecast. The crowd is expected to grow as results time draws near. 1.30pm: Ong Tee Keat and his team leave Nikko Hotel. He is limping, not fully recovered from his Achilles' heels operation. He has skipped physiotherapy for two weeks. 1.20pm: MCA administration chief Lim Chin Hai says scrutineers have been divided into 24 groups. They are not allowed to leave the hall until counting ends. The counting will start with central committee posts. The tally for the president’s post will be the last one. 1.00pm: Scrutineers asked to put their handphones in envelopes. MCA staff will hold the handphones for them until counting ends. 12.40pm: Chua Soi Lek, Loh Seng Kok, Tee Siew Keong and Chong Itt Chew leave Nikko Hotel after lunch. Kong Cho Ha has just left. Donald Lim is still in the hotel. So are Ong Tee Keat and his people. 12.15pm: Voting process ends. The ballot boxes are being sealed. Counting to begin after 1pm. 12.05pm: Central delegates have finished voting. Now the scrutineers, who are also central delegates, are voting. 11.30am: Ka Ting says MCA elections are smooth and orderly and that he is happy with the delegates’ turnout. He says it shows that all delegates value unity and harmony. Hundreds of campaigners who thronged the hallways leave, leaving the party HQ seemingly deserted. 11.10am: Ka Ting leaves the hall after casting his vote. He will return after the tally to hear the results later today. 10.30am: Registration ends. 2,318 (97.52%) out of 2,377 central delegates have registered. 10.08am: Yik calls party general assembly to order. Datuk Dr Mah Hang Soon appointed Chief Scrutineer by the election steering committee. There are 48 scrutineers. 10.06am: Yik said 2,316 (97.43%) out of 2,377 central delegates had registered to vote by 10am. 10.05am: Media asked to leave the voting hall. Speaker Datuk Yik Phooi Hong takes the stage to start the EGM and polls. 10.00am: Central delegates taking their seats. KUALA LUMPUR: The MCA elections is on today and all eyes are on the three-cornered fight for the presidency that is too close to call. Today, 2377 delegates will make the decision that will chart the future course of the party.